Five Knife River villages of the friendly Mandan and Hidatsa Indians. Courtesy of the National Park Service. During the long winter months, the tribesmen made and mended clothes, spent time with family and passed on tribal history through stories and songs. The Springtime weather gave them the opportunity to hunt, plant, and mingle after months of confinement in winter quarters. 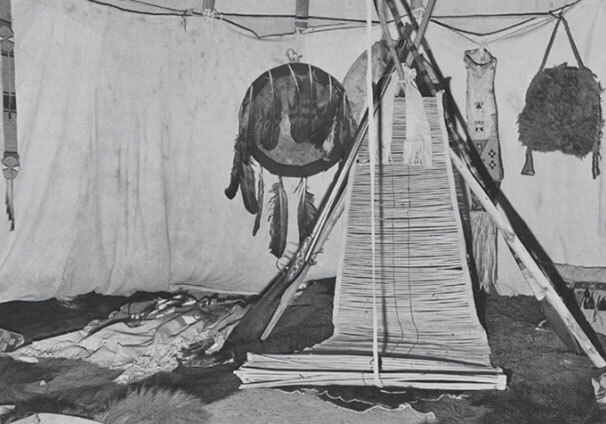 Summer was time for traveling for trade and gathering for ceremonies and celebrations. The Fall was for food gathering and preparation for the rigors of winter. Generations of Plains Indian people adapted to this cycle, developing distinct and specialized skills that characterize their cultures. 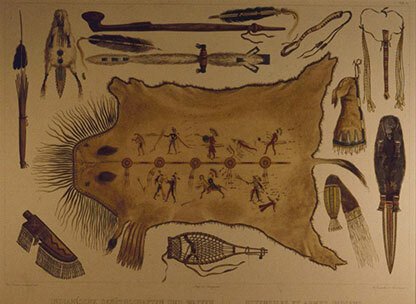 Indian Utensils and Arms - painting by Campbell. Courtesy of the National Park Service. Most Americans know the names of nomadic hunting tribes, such as the Lakota, Cheyenne, or Crow. 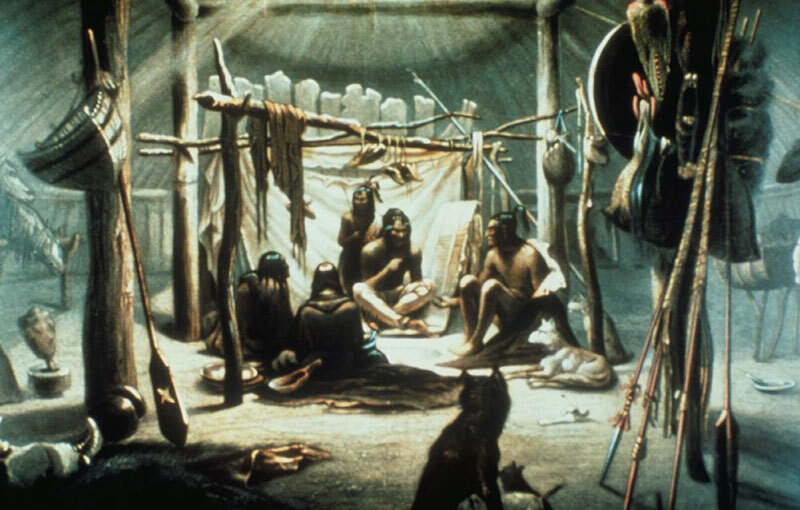 However, Plains Indian tribes like the Hidatsa and Mandan lived in permanent villages and raised corn, beans, and squash in the rich soil along river floodplains. These areas became the hub for trading which extended for thousands of miles across North America. 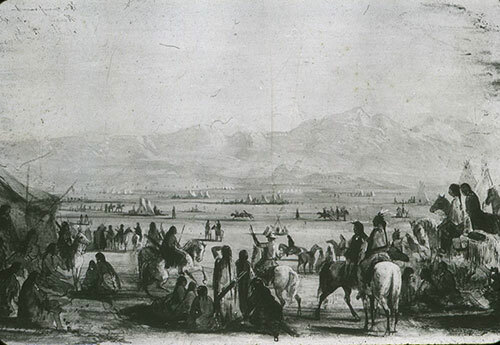 Horses, buffalo meat, and hides traded along with European goods and negotiated for agricultural products. 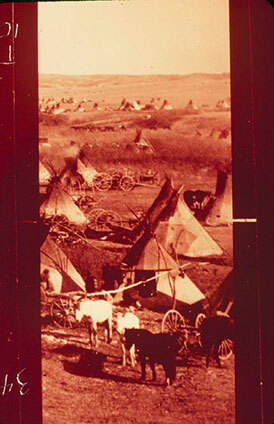 Group of American Indians camped on mountain plain. Courtesy of the National Park Service. Thousands of buffalo roamed the Great Plains grazing on abundant prairie grasses during the 1800’s. The Plains Indians relied on these herds for food, shelter, and clothing. Buffalo was special and sacred to the Plains Indians. To this day, the buffalo figures prominently in Plains Indian stories, songs, and ceremonies. Thousands of men, women, and children died defending their traditional way of life as settlers flooded the Great Plains. The government moved the rest into reservations and made their songs, dances, and ceremonies illegal. With the buffalo herds slaughtered to near extinction, many people feared the Native Americans would also become extinct. Today we are experiencing a resurgence in the Plains Indian culture in art, music, literature, and film. A public celebration and demonstration of community pride in Indian culture is called powwows and is a now common expression of Native American pride. Museum Education Programs at Jefferson National Expansion Memorial interpret traditional Plains Indian life and its significance in American history.